Our 6th birthday party at Hersheypark. Liz is the blonde front-row center. 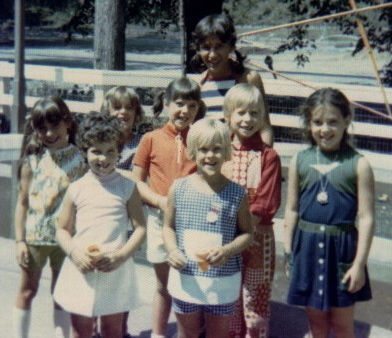 I'm on the far right in the blue and green outfit. Thanks to the connective powers of Facebook, I exchanged messages this weekend with my childhood birthday party partner. “Happy birthday!” I wished Liz, who has always led me into the next year by a day. “I’m headed to my parents’ house today — we could have a joint party for old times’ sake! !” I wrote. “Scavenger hunt!” came the quick reply, a reminder of the last time we attempted to recapture the old days. We were sweet 16 and hadn’t had a party together in 10 years. “God, no, Liz … ANYTHING but a scavenger hunt!” I replied, trying to shake off the memory of the ill-fated attempt to mix friends from our different social circles. Yes, Liz and I began life in the same hospital and stayed close through our early years. And though our lives had remained pretty parallel — swim team, school, band — our interests, talents and personalities diverged just enough to make a big difference. I caught a new glimpse of our parallel universes when she wrote about taking one of her kids to college this week. “I will wear really big sunglasses to hide my tears,” her status said. So that means that on Monday, while she’s sending the older of her two sons off to college, I’ll be sending the younger of mine off to kindergarten. Interesting bookends, I thought, in the lives of two now-moms born just one day apart so very long ago. All these years later, Liz is still leading the way into new stages of life. This time, though, it’s going to take me far more than a day to catch up. Meanwhile, on Monday, I’ll take a cue from her as I send my little guy off to his first day in elementary school … I’ll be wearing my big sunglasses, too. What do you gain when you authentically connect with friends, old or new? Oh, Hollee. I didn’t mean to make you teary. Maybe we’ll have to have a little long-distance “tea and tissues” session after you drop your little one off tomorrow!